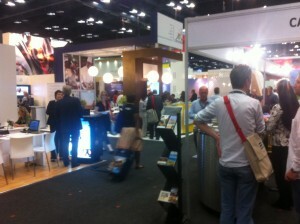 What a fantastic experience Indaba 2012 was. It was great to meet our suppliers and to meet a few new ones and to just generally get the feel for the state of the industry in 2012 South Africa. We used the Cape Country Routes stand as our base. The 2012 Indaba was also the perfect opportunity to rebrand or at least, start the rebrand process for CCR. We started off with the introduction of the new CCR map which is quite a departure for the brand but it was met with such overwhelming support by current members and by industry stalwarts, that the whole new direction seems the logical one. CCR is different from Classic Retreats, Found, or any of the other groups that we belong to in that the members are actually the owners of the product. That allows these product owners to be very hands-on with the development of the brand and the direction that the brand takes. This sense of ownership and pride in the product was tangible at this year’s Indaba amongst the CCR people and we are keen to get the ball rolling with the further redevelopment of the brand. Watch out for CCR’s new look at next years Indaba, ITB and more.